The days are shorter and the weather is blustery — but that doesn't mean you need to stay indoors! NPCA has a few pointers and favorite places to explore during the winter months. Mojave National Preserve's Kelso Dunes offer a visually beautiful and flexible winter hike. Photo © Shane Farnor. Though the cold weather and dark days of winter may discourage time outdoors, hiking during these months can be a fantastic and memorable experience. Crowds disappear, silence reigns, and landscapes take on a glittery and frost-covered splendor. Here are a few practical tips to help ensure a positive hiking experience for you and your loved ones. Plan ahead to ensure a safe and enjoyable time. Check the weather forecast, call the park for trail conditions, and understand the physical limitations of everyone in your group. Dress in lots of layers and pack a waterproof shell. Choose materials that dry quickly (not cotton) and be sure to shed layers to prevent yourself from getting too warm. When you take a break, your body will chill quickly (especially if your clothes get damp), so layer back up to maintain your temperature. Wear appropriate footwear for the trail. Are you hiking on a level, dry rail-to-trail? Or over a snow- or mud-covered trail? Pick shoes that fit well and have good traction. Waterproof shoes and/or gaiters are a plus. Consider bringing crampons if conditions could get icy. Tell others your plan. Leave your expected itinerary and estimated time of return with a loved one. Use the buddy system. While it’s always wise to hike with at least one other person, this is especially true in the winter months. Remember, it’s winter! Know that the mileage you can cover on a typical hiking day during the short winter days will be much lower than in the height of summer when you may have as much as 15 hours of daylight. Eager to hit the trail? My colleagues at NPCA recommend these six hikes as a few of their favorites for enjoying the winter weather. 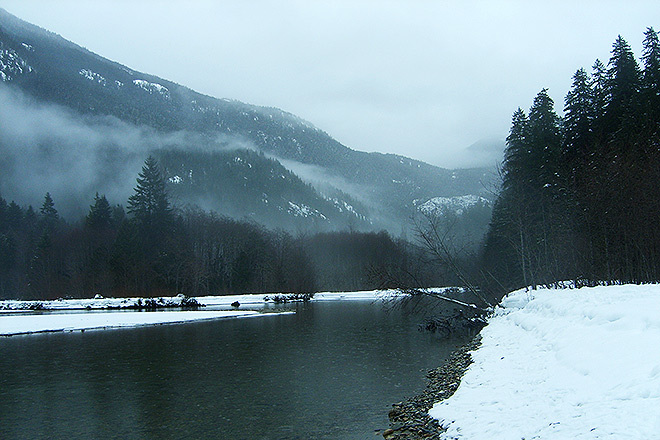 Ross Lake’s Thunder Creek in winter. Photo © Shane Farnor. Located between the north and south units of North Cascades National Park, this beautiful trail follows an arm of Diablo Lake before continuing along the glacier-fed Thunder Creek. Take note of the turquoise color of the water, a product of “rock flour” which consists of tiny particles of bedrock that have been dug out and pulverized by the movement of glaciers (though this phenomenon is more pronounced in the spring when more water runs off from the glaciers). Towering around you and scenting the air as you walk are ancient, lichen-covered cedar and fir trees. Shane says, simply, “It’s a magical trail.” Need we say more? Note: Depending on the snow cover, you may want to opt for snowshoes rather than boots. Majestic Mount Rainier in winter. National Park Service photo. While the snow- and ice-covered lakes may preclude the reflections in the hike’s name, David promises this trail is “a classic Mt. Rainier winter experience” that offers “breathtaking views of the mountain.” From the parking lot, take the path that circles into the forest and up to the road. When you see a sign, opt for the avalanche-free route to the lakes (the High Lakes Trail). Part of this hike involves a sometimes-steep climb up over the saddle of Mazama Ridge. You’ll then drop into a meadow beside the lakes. On a clear day, your camera will hardly do this trail justice. Note: Snowshoeing is recommended. The park concessionaire rents snowshoes; check at the Longmire General Store for availability and rates. 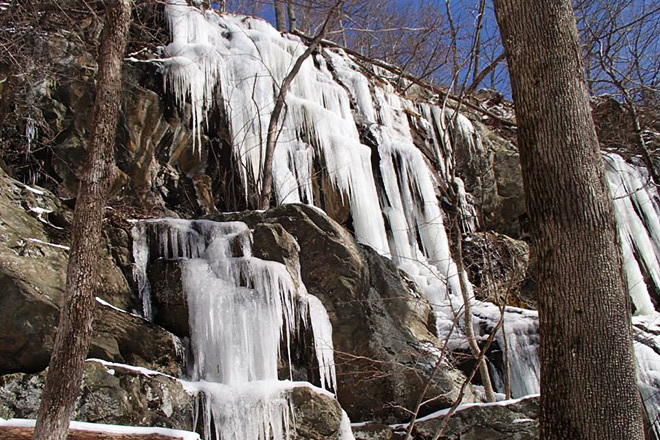 Frozen waterfalls in Shenandoah’s Whiteoak Canyon. Photo © Ben Sander. Shenandoah National Park boasts some beautiful trails and spectacular scenery at all times of the year. If you want to beat the heat and the crowds, and if you have a soft-spot for “gorgeous, frozen waterfalls,” Ben says this challenging loop hike may be for you. From the Whiteoak Canyon parking lot, travel counter-clockwise following the Whiteoak Canyon Trail past a series of waterfalls that appear stuck in time, dangling like icy daggers. To complete the loop, take the Whiteoak Fire Road, bear left onto the marked horse trail, and continue on to the Cedar Run Trail back to your car. 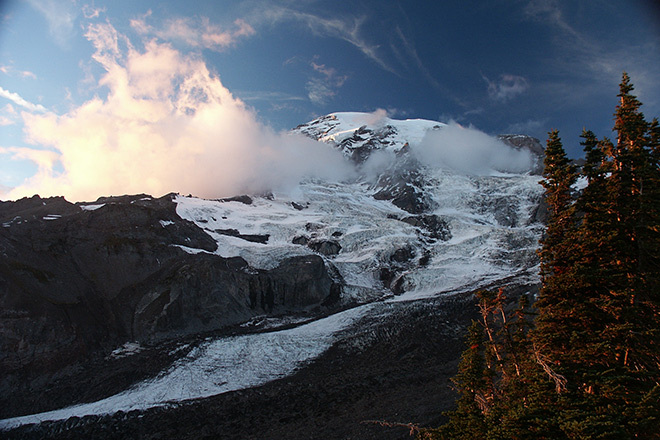 While all that slick rock and carved ice makes for one incredible hike, exercise caution. You may find Yaktrax (or a similar traction device) a necessity. 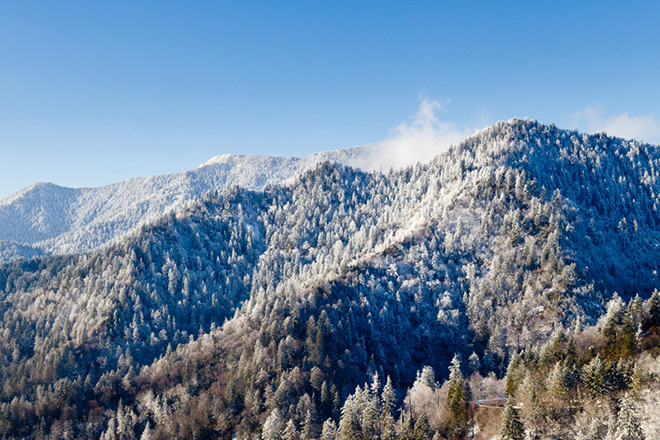 Great Smoky Mountain’s famous undulating blue peaks–such as Mount LeConte, shown here–get frosted white in the winter snow. Photo © Steve Heap/Dreamstime. Located south of Gatlinburg, Don sings this trail’s praises, stating it’s a “winter wonderland.” At its terminus, the summit of Mt. LeConte at over 6,500 feet above sea level awaits. If you’d guess that most of this trail ascends, you’d be right. The views and pit stops along the way, however, will take your breath away, even if the thin air doesn’t. You’ll pass Arch Rock, have a view of the Eye of the Needle from Inspiration Point, and be able to duck into Alum Cave–which is actually more of a rocky alcove than a true cave. As the climb continues, be careful of your footing, especially in the sections with cable handholds. About a half mile before you hit the true summit of the mountain, you’ll find LeConte Lodge — which, like the cave, is less a lodge than a series of charming, rustic cabins. Visit the summit, the third-highest in the park, and then continue for a quarter-mile to Myrtle Point for a fantastic view of the mountains and the Tennessee Valley. Due to icy conditions on the trail, park staff recommend sturdy footwear and crampons during the winter season. Park officials will conduct maintenance on this trail over the next several years, starting in May 2015. Check the park website before you go to make sure it won’t affect your hike. Note: If you want to literally unplug for a night and sleep in one of the LeConte Lodge structures, be prepared to book well in advance, as these cabins fill up quickly. It really is narrow. 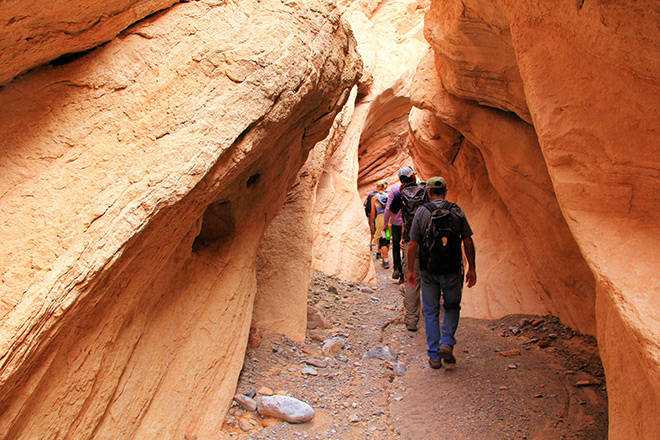 Hiking the Anniversary Narrows at Lake Mead National Recreation Area. Photo © Lynn Davis. While this trail requires more caution than others we’ve listed (see note below), Lynn says this slot canyon located about an hour outside of Las Vegas is a “must-see.” With its vibrant orange walls, narrow twists and turns, and beautifully layered rocks that serve as a hands-on geology lesson, Anniversary Narrows leaves little to be desired. And, in an area of the country typified by extreme heat, the winter season is an ideal time to plan a visit. Start out in long sleeves, and you might just end up in short sleeves by hike’s end. Note: Depending on where you park, you may need a 4-wheel drive vehicle, or at least a vehicle with high clearance. There are some active mining operations in the area, so take care to avoid them. Finally, as with most canyons, do not plan a hike in this area if flash floods or thunderstorms are in the forecast. 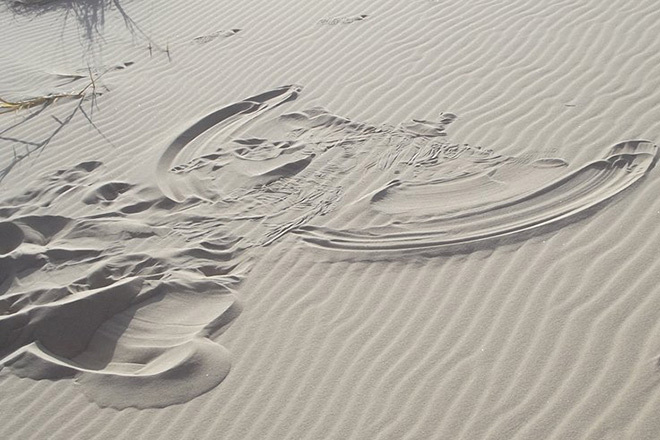 A sand angel in Mojave National Preserve’s Kelso Dunes. Photo © Lynn Davis. Some of the highest and vastest dunes in our country, measuring in at nearly 700 feet and over 45 square miles, the Kelso Sand dunes are a natural marvel. With no defined trails, these dunes are yours to explore. Maybe you’ll see a mirage, maybe you’ll hear the sands sing beneath your feet, or maybe you’ll regress to childhood and embrace the winter by flopping onto your back and making your very own “sand angel.” No matter your purpose or destination, Lynn assures us that hiking among these beautiful and desolate dunes is sure to leave you speechless. If you go: Be sure to bring a compass or GPS device, especially if you are unaccustomed to hiking through dunes. It’s easy to get disoriented in the middle of all that sand.